I’ve been a fan of Dolly’s since she appeared on the Porter Wagoner Show back in the 70’s and 80’s! Yet I was not aware of all her philanthropy. This post from Amy Rawe’s blog “Rawe Struck” is a wonderful piece. Enjoy! I’m not a good gardener, but every couple of years I find myself attempting to grow tomatoes, and melons, and cucumbers. Wonderful blogpost by Ashley Boynes-Shuck. I recommend it highly! Missed Going to Church – AGAIN! Today wasn’t a very good day. Just turning over in bed was difficult and painful. Wrap your hands in about 6 layers of gloves, and put splints on your wrists and elbows so they don’t bend well – then try to brush your teeth with a Sonicare electric toothbrush. And fix your hair. I should have asked for help – but I couldn’t bring myself to do that. So some of my teeth were ignored and my hair didn’t get brushed. Just “combed” it with my fingers – kind of – and stuck a barrette in it. By that time I was so exhausted, I couldn’t even get dressed – managed to put on a housecoat, and slide into my Crocs. He had also made Raspberry Tart cookies for me for Valentine’s Day. But today, just for a change, I put Black Current Preserves in mine. Delicious. And “we should not dread any human ill, save sin alone; neither poverty, nor disease, nor insult, nor malicious treatment, nor humiliation, nor death” (St. John Chrysostom, On the Statues), for these “ills” are only words; they have no reality for those who are living for the Kingdom of Heaven. The only real “calamity” in this life is offending God. If we have this basic understanding of the purpose of life, then the spiritual meaning of bodily infirmity can be opened for us. So I work on accepting my suffering as a step toward my spiritual purification. And I am grateful to God for this time I am allowed with my husband. Despite pain, despite feeling really ill, I turn again and put my trust in God. On one occasion a woman was brought to St. Seraphim of Sarov. She was badly crippled and could not walk because her knees were bent up to her chest. “She told the Elder that she had been born in the Orthodox Church but, after marrying a dissenter, had abandoned Orthodoxy and, for her infidelity, God had suddenly punished her….She could not move a hand or foot. St. Seraphim asked the sick woman whether she now believed in her Mother, our Holy Orthodox Church. On receiving a reply in the affirmative, he told her to make the sign of the Cross in the proper way. She said that she could not even lift a hand. But when the Saint prayed and anointed her hands and breast with oil from the icon-lamp, her malady left her instantly.” Behold, thou art made whole; sin no more, lest a worse thing come unto thee! This connection between body and soul, sin and sickness, is clear: pain tells us that something has gone wrong with the soul, that not only is the body diseased, but the soul as well. And this is precisely how the soul communicates its ills to the body, awakening a man to self knowledge and a wish to turn to God. We see this over and over in the lives of the saints, for illness also teaches that our “true self, that which is principally man, is not the visible body but the invisible soul, the ‘inner man’“ (St. Nicodemos of the Holy Mountain, Christian Morality). Although I did not marry a dissenter, I am aware of many of the reasons I need to repent. Great Lent is near, and the Glorious, Bright, Holy Pascha at the end. Healed or not, this is what I dream of and hope for. The Pascha of our Lord. And the eventual time when Himself and I go to meet our Lord – with no more pain, no more fatigue. This is my focus for Great Lent. A World Aware of RD! I start at the County Courthouse on the square. All the flights of stairs into the building are newly surmounted on each side by gently inclining ramps. The elevator inside has been revamped to hold 2 wheelchairs at a time. The floors are smooth, and the crevices between the rooms upstairs have been filled and smoothed over. After visiting the handicap-accessible restrooms on the second floor, I ride down the elevator and exit via the door on Pike St. The walkway curves gently around through the grounds under the oak and willow trees to the exit on S. Clayton St. The sidewalks have had their old tiles reset so the sidewalk is now smooth. There are cutaways at each of the intersections, and one in the center of the block for accessing the shops along that side of the Courthouse. I cross, carefully, in the middle of the block. People stop, smile, and wave as I scooter across the street as fast as I can! In Red Hats for Us, a little girl, accompanying her grandmother, says, “Granny! Why is that lady riding a scooter in here?” Her Granny winks at me, and says, “Laura, that’s Mrs. Riggs. She has Rheumatoid Disease. She can’t walk far or long at a time, and she has problems holding things in her hands. She lost her voice because the disease affected her voice box. When you go over to shake her hand, shake her wrist so you won’t hurt her hand. Go on, now.” Laura comes over to shake my wrist. I smile and say, “Hello, Laura, I’m delighted to meet you.” She smiles and I smile at her. Later, I meet my husband at McCray’s Tavern on the Square. The Maitre’d opens the door and holds it for me. He smiles at me as I come in. He shows me to a table that can accommodate my scooter or a wheelchair. I turn the seat of my scooter so I can face the table to eat. After lunch, we go to our van. It is parked in a handicapped slot near the front door. The curb is cut away with a gentle slope onto the accessibility lane between van spots. I can get off my scooter at my door. My side is equipped with a handle to help me get in, but my hands won’t let me use it today. Instead, I use a Handybar that I can rest my forearm on instead of using my hands. My daughter has added some padding so my forearm bones don’t get bruised. We drive down into Atlanta. Each intersection within the city limits has been re-done with cutaway curbs, well designed ramps, and wide pedestrian (and wheelchair and scooter) lanes. The crossing lanes are wide and have been smoothed to reduce the risk of tripping or tipping. I can tell my husband is worried – about me. I take his hand and squeeze it gently. Finally, they call my name, and we both wheel in on our scooters. The cardiologist (also my husband’s cardiologist) reviews my records from the rheumatologist, then carefully listens to my chest and orders an EKG, a chest X-ray, and an echocardiogram. If these are normal, I may not need additional tests. If not, I may need a cardiac CT and a cardiac MRI. They talk a few minutes, then the physician leaves and I go to the room for the EKG. Next will be the chest X-ray and the echocardiogram, but they must be done over at the hospital tomorrow, so we leave. The next day I am so tired, stiff and sore, but I must go get the chest X-ray and echocardiogram. Another 30 miles each way – a 60 mile trip. They get me in and out in a record 2 1/2 hours! I wish I could say we stopped for lunch at Ted’s Montana Grill, but that is ‘WAY too rich for our pocketbook! Instead, we lunch at a nice little restaurant in Peachtree Battle Shopping Center. Tomorrow probably won’t be so great, especially after these two days of overdoing. I think about the day before. It was as if, suddenly, everyone I encountered understood. Hands, feet, heart, incapacity, yet they did not look at me: confused, disbelieving, irritated, pretending I was not there, or clueless. What a difference from years gone by! I check with my doctor’s office by phone about the RPF clinical trial they applied for me to be on. I’ve been accepted! I start in 2 weeks! I’ll have to write a thank-you note to RPF! What a difference Rheumatoid Awareness makes! I’m feeling happier than I ever believed I could! Unfortunately, however, at this point I woke up! Let’s make the world I described above happen! Please visit the RPF website and learn about Rheumatoid Disease. Then become a member. The Rheumatoid Patient Foundation is a 501( c)3 organization; it deserves your support. Rheumatoid Patient Foundation. 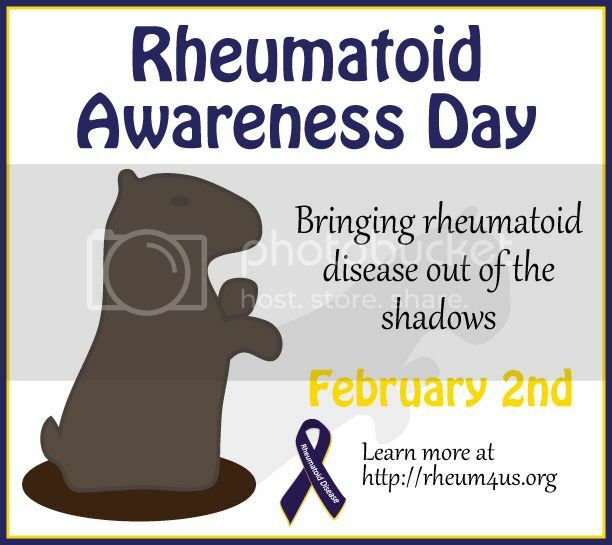 … Rheumatoid Awareness Day.